Experimentations into the 3rd dimension……. 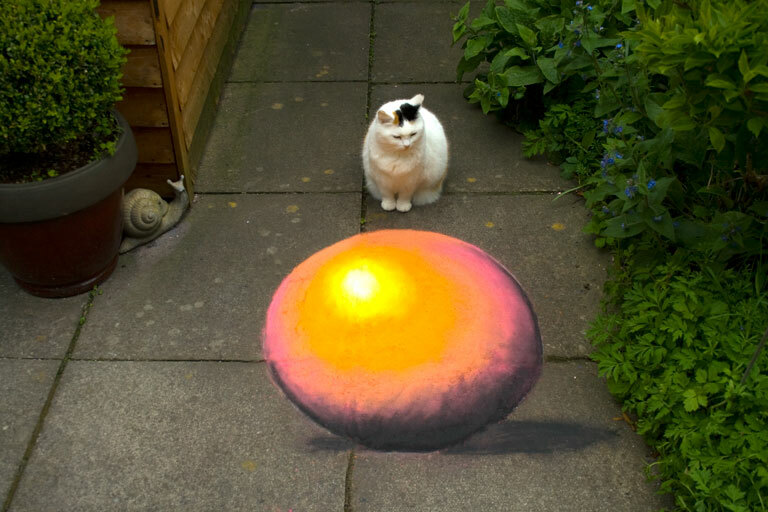 Just been experimenting with some 3D art in the garden……did this lovely colourful ball for Rosie, our cat. This took about twenty minutes to do…..basic geometric shapes in isolation can be difficult to make look 3D but this isn’t bad for a first time effort, you can imagine if there was a lot more going on in the picture then all the slight imperfections would be overlooked. I’ve probably used the wrong colour combinations here and the ball is way too shiny and could be rendered better but its only a working sketch to give me an idea of form and structure. I’m not a great fan of anamorphic art but I can’t begin to tell you how many times we’ve been asked to do this kind of art only to turn it down on principle. We’ve got a gig in Manchester (Platt Fields) tomorrow where we shall be doing more experimentations into the world of 3 dimensions…..
07 May	This entry was published on May 7, 2010 at 1:57 pm. It’s filed under arts, culture, street art and tagged 2010, 3d, anomorphic, art, battle, canvas, cat, chalking, experiment, pavement, philip, rosie, street, urban, urbancanvas. Bookmark the permalink. Follow any comments here with the RSS feed for this post. Older: Our Liverpool Lou has arrived……. Newer: Silly little cutouts gone all 3D…….